Enjoy 50% discount for New Year celebration! Grab your license now! Promotion ends 08.01.2015. Came across this while looking for something to lower the volume in itunes and BF4 when I use my mic. I couldn't be happier with the results, was very easy to use and works perfectly. Auto-Duck in Real Time ver. 2.0.1 has arrived! This update contains some bug-fixes and one new feature - option to exclude applications from [All but selected] ducking channel (button Exc). I have used this software for quite some time, and it is an excellent piece of software. I highly recommend it to anyone that constantly adjusts their volume settings before broadcasting for optimal microphone, and sound volume. Auto-Duck in Real Time ver. 2.0.3 is here! Great program Wojciesh! Use it every time I stream. I got question for you - what do you want to see in next Auto-Duck update? You are also welcome to suggest other features - please post it in this thread. I picked noise gate, even though that can already be done in xsplit and obs. a pop out spectrum analyzer for each channel. More than a 2x boost for the input. Noise-gate is on the lead ;) But I will wait some time for more votes. Boost is nice option, I will include it in next update, thanks! Thanks for voting on next features, I will still wait for more votes. So end of the day does this work for the X-Capture 1 or not? Because that's all I need it for. I asked in the OBS IRC and it doesn't. Oh well, let me know when it does. Maybe you can send him PM to share his setup. Seems like a lot more effort and I need it output to a sound device at all times. Sorry, there is no other way to do this in current Auto-Duck engine. Thanks for voting on next Auto-Duck update. I have already fixed some bugs (microphone related), so I will release minor update very soon. Then I will make wizards for popular use-cases and release it as next major update. PS. This is just minor update, I'm working on bigger update (it will contain wizards for popular use-cases like auto-ducking when streaming with OBS). Its a shame this doesnt work too well in OBS if your using 'Video Capture Device' in source to use a dedicated capture hardware (i use Micomsoft XCAPTURE-1 device), as it cant seem to communicate with the capture hardware and so it doesnt duck the audio. Only way around this is to go to the settings in OBS for the capture hardware and use 'Output Audio To Deskop' rather than 'Output Audio To Stream Only', only down side in doing this is it cause massive audio lag when watching the file back. Is there a way to hardcode ducking into OBS so it can actually communicate with capture hardware??? There is an alternative that I've just discovered today actually. It just requires GraphEdit (200kb) program. 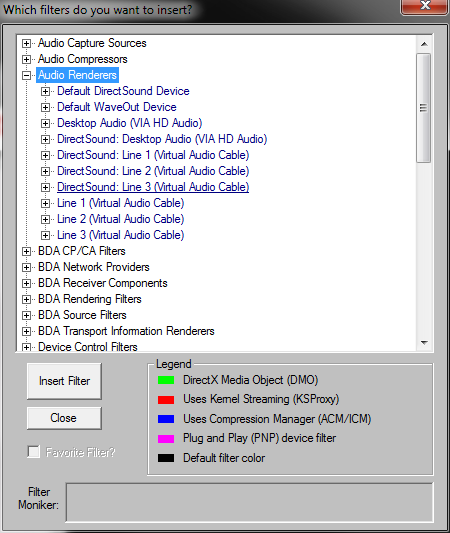 It allows you to specify the Audio Device to output to in Windows. So if you're using VAC, you can output to Desktop Audio, Line 1, Line 2, etc... Also, it will be able to duck ONLY your Capture Card audio. 2) Click Graph, then Insert Filters. Click the + next to Audio Capture Sources. The following will pop out. 4) Again, go to Graph, then Insert Filters. This time, click the + next to Audio Renderers. 5) From your choices select which audio device you'd like to output to. I recommend the "DirectSound" variants. They have given me no issues. I chose "DirectSound: Desktop Audio"
6) Click and drag the small box (pin) next to Audio Capture and drag a line to Audio Input Pin (rendered). 7) Now click the Green Play Arrow, and you should hear sound. 8) All that's left is to add GraphEdit into Auto-Duck and configure settings. One limitation is that you cannot delay the audio stream this way. So if you're trying to compensate for your mic/effects, this will not be viable.